The Centre for Canadian Language Benchmarks developed the CLB 5-10 Exit Assessment Tasks to provide instructors with a way to confirm the levels that their learners are at, at the end of a course or a training period. This online course should take approximately 120 Minutes. Become familiar with the document and the supporting materials that you use to conduct the assessment. Understand when and how to use CLB 5-10 Exit Assessment Tasks appropriately. 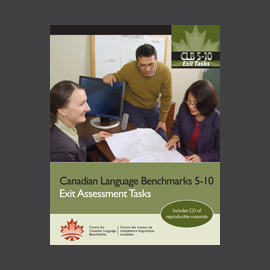 Learn how CLB 5-10 Exit Assessment Tasks can be used in a PBLA environment, and about their relationship with the Canadian Language Benchmarks. You will also gain confidence in using task-based assessment as you practice using scoring materials for Speaking and Writing. To complete this training and any assessments with your students, you MUST have a copy of the CLB 5-10 Exit Assessment Tasks book. To purchase one or more copies of this book, please click on the image below and complete your order by adding it to your cart (changing the quantity if needed) and completing the checkout process.